Besides which, David-Nicolas’ irritation at not being able to actually eat his dish while it’s still hot – so I can take a few pictures – tends to tarnish the restaurant experience. And I completely get that – he just doesn’t get it! But it’s not as if I’m trying to turn him into an Instagram Husband. He’s naturally an Insta-Parisian Husband, instantly irate at the least suggestion we shouldn’t tuck in to our food immediately. So even though my last post was also about a restaurant, this one is more about the kind of place where we can just kick back and relax, especially on an outdoor patio in summer. It’s the kind of restaurant friends run, and where we also run into friends – an informal meeting spot for local artists on a break or after work. This restaurant’s motto really speaks volumes: Restaurant et bar à vins, comme à la maison. Our friends Alice and Azid, former “life partners” (and still business partners! 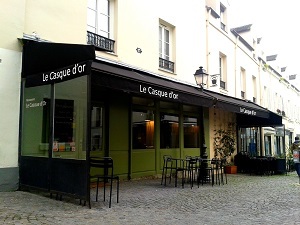 ), opened Le Casque d’Or in 2007. Although Azid had plenty of restaurant experience, Alice didn’t quite know what she was getting into. And after their hired chef didn’t show up one day, Alice found herself behind the piano, or stove, as head chef! So she decided to learn how to cook professionally by attending a local culinary program headed up by Thierry Marx, who I just saw today with my friend Mary at the Grand Palais during the Taste of Paris chef festival. Marx grew up in the nearby rough-and-tumble but now quickly gentrifying neighborhood of Ménilmontant, so that’s where he opened his cooking school. He wanted to offer the guys, les gars de Ménilmontant (so named for a Maurice Chevalier song), an opportunity to train and work as chefs in restaurants. Note: The school also happily accepts women. Alice says she was a little surprised at the rude, or rough, nature of working in kitchens. Far from glamorous, kitchen culture in France is still by and large a sexist, tough environment. 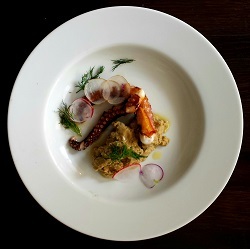 But she had the chance to work with a few well-known chefs, and their aesthetic shows up on Alice’s plates: she cooks only seasonal products, and changes the menu almost daily to reflect the market’s best ingredients. But what of her restaurant’s name, Le Casque d’Or, or Golden Helmet? The name’s origin lies in what we would call a juicy story – but the French would call une histoire croustillante, or a “crispy” story. Back in the good old, bad old days of the early part of last century, Apaches, or gangs of thugs, roamed the streets of eastern Paris. They weren’t Native Americans, but you can find out more about them – and their stylish footwear – in this post. When two rival gang leaders fell in love with the same woman, a fight broke out. The object of their affection? Amélie Élie, otherwise known as Casque d’Or, for her helmet of golden hair. 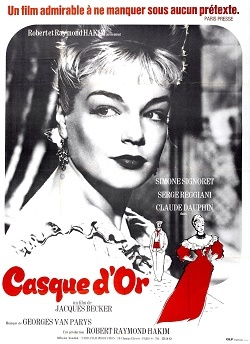 After local tabloids got hold of the story, Casque d’Or became a city-wide star, henceforth known as “Queen of the Apaches.” The fighting, as well as the filming of the 1952 Jacques Becker film Casque d’Or starring Simone Signoret, both took place in a tiny street in Belleville (which you can visit during my Walking tour of Belleville). In my area you can also visit Simone Signoret — in the Père Lachaise cemetery. Anyone will admit that Amélie was not, let’s say, a woman of pure values. She frequented Apaches of several gangs, one of which was called Les Gars de Charonne – the Charonne Guys, named for their “village” which had been incorporated into the eastern part of Paris in 1860. So we know that Amélie spent plenty of time in Charonne (mostly on the sidewalks, ahem), near the current location of the Casque d’Or restaurant. Today, the Charonne quartier is home to the famous nightclub La Flèche d’Or and the Philippe Stark-designed über-hip hotel Mama Shelter. 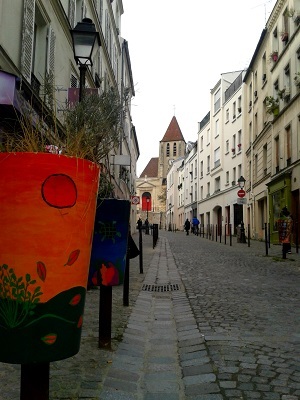 And you can even visit a lovely little park, the Jardin Casque d’Or – not far from Alice and Azid’s restaurant. But don’t expect any women of the sort who linger on the sidewalks! Even though I don’t write restaurant reviews on my blog, I have plenty of recommendations, which I prefer to give out personally. Feel free to contact me or leave a comment or question below if you’re looking for a place to eat in eastern Paris. 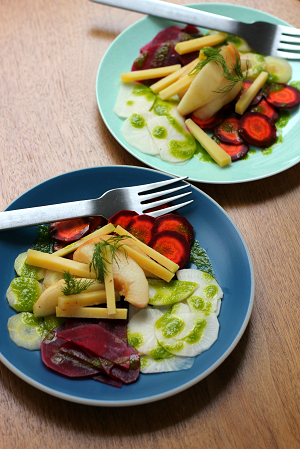 Given to me by Alice, head chef of Le Casque d’Or, this recipe’s strength lies in its two main preparations: super-tangy quick-pickled vegetables and the perfect foil to that tang: flavorful herb oil, which is much more herb than oil, though you’d never guess! For pickling the vegetables, if you want a less “vinegary” brine and softer flavor, use cider vinegar instead of white wine vinegar. Feel free to play around with the vegetables you use. If you’re short on time, you can just use beets: the total weight for vegetables for this recipe is a little over a pound. So use any combination you like: beets and/or carrots of any color (like the white satin or purple haze carrots I ended up with from the market!) 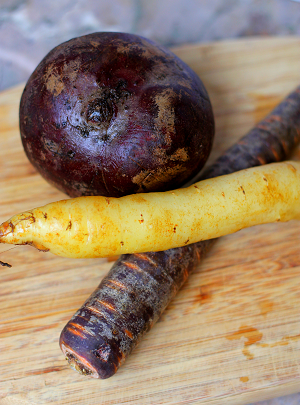 or even peppery black radish, which I used for the version in my photos. 1. The beets need a bit of pre-cooking before the quick-pickling stage. Using a food processor’s slicing blade, finely slice the peeled beets. Or, if you have a mandolin slicer, slice the beets to about ⅛-inch (3mm) thick. 2. In a small saucepan, bring to the boil over medium heat 2 cups (475ml) water with the butter, sugar, salt, and lemon juice. Then add the beet slices, bring back to the boil, and lower the heat to medium-low. Cook the beets, covered, about 15-20 minutes – when you poke a sharp knife into a beet slice, it should be slightly resistant or al dente. 3. Drain the beets and let them cool in a medium bowl. 4. Again using a food processor or mandoline, thinly slice the carrots and other vegetables if using. Place each vegetable separately into small-medium bowls. 5. To make the pickling liquid, in a small saucepan, heat the water, vinegar, sugar, salt, and pepper to boiling. Pour this mixture over each vegetable, including the beets, and marinate in the pickle for 30 minutes. 6. To make the herb oil, bring the water to a boil in a small saucepan. Add the herbs, and boil them for about 1 minute. With a slotted spoon, transfer the herbs to a bowl of ice water. Transfer 3 tablespoons of the cooking water to a separate bowl to cool for 1 minute. Remove them and drain them well. 7. Using an immersion blender, purée the herbs with the 3 tablespoons cooled cooking water. While continuing to blend, add the oil and then the salt. 8. To assemble the salad, plate each vegetable as you like (either mixing the vegetables or keeping them separate on the plate). Peel the pears and rub them with a little lemon juice, and cut each pear into lengthwise quarters, sprinkling with lemon juice as you go. Distributing evenly, assemble the pears and the comté cheese as you like – I piled them in the middle, going for a little height on the plate. Then drizzle a teaspoon (or more!) of herb oil on the vegetables, and finally, decorate with the herb sprigs. Voilà! I wanna make all your recipes, not only because they read as if they’ll be delicious but also because the accompanying history is so fascinating. Good job!